A new approach to treatment called immunotherapy is providing hope to many lung cancer patients, thanks to researchers at The Ohio State University Comprehensive Cancer Center – Arthur G. James Cancer Hospital and Richard J. Solove Research Institute (OSUCCC – James). Our oncologists and cancer researchers are developing prevention strategies and treatments that target each person's specific cancer. And using this approach to fight lung cancer is particularly important, because lung cancer is the number one cancer killer among men and women. About 224,000 people are diagnosed with lung cancer each year, and most are diagnosed at a late stage, making them more challenging to treat. "Cancer cells develop all the time, and the body's immune system eliminates them," says Dr. David Carbone, director of The OSUCCC – James Thoracic Oncology Center. However, cancer cells are able to produce a "force field" around these growing clusters of mutant cells, protecting them from the immune system and allowing for uncontrollable growth. In recent years, doctors and scientists such as Carbone and his colleagues at the OSUCCC – James have developed ways to re-energize the body's immune system, defeat "force fields" surrounding cancer cells and enable the immune system to seek out and destroy these rogue cells. This is called immunotherapy, and it's one of the most promising areas of cancer research and treatment. Think of cancer research as completing a very complicated puzzle, with many people contributing vital pieces. The basic science work of Carbone and his lab team was one piece, but another key piece of the puzzle helped make the picture complete. "Researchers found an important immunologic checkpoint protein called PD-L 1," Carbone says. "It acts like a force field around the cancer cell. If you have a drug that blocks PD-L 1, a checkpoint inhibitor, it allows the immune system to see and kill the cancer." These new immunotherapy drugs have improved Carbone's ability to treat and prolong the lives of his lung cancer patients, especially those whose tumors have a high level of PD-L 1. That's about 30 to 35 percent of his patients. 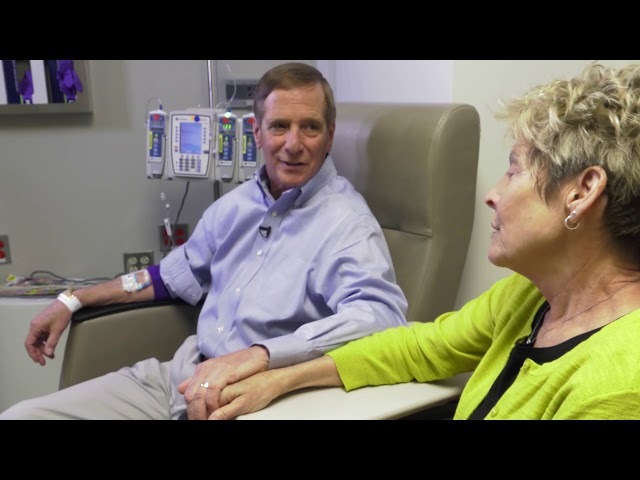 "The response is up to 50 percent in patients with the highest PD-L 1, which means major shrinkage or total elimination of the tumors," he says. In April 2018, researchers announced that combining immunotherapy with traditional treatment for localized lung cancer doubles the likelihood of survival. And these gains are just the beginning with immunotherapy, which Carbone says is still in the early stages of development. "Building on these results, we're looking at new therapies for lung cancers involving gene-modified cells and custom vaccines," Carbone says, noting that the OSUCCC – James has clinical trials underway for cell-based treatments as well. That's why researchers and oncologists at the OSUCCC – James study the unique genetic and immune makeup of each patient's cancer. Their discoveries deliver the most advanced individualized treatments, leading to better outcomes, fewer side effects and more hope for cancer patients and their families in Ohio and around the world.